After entering the Peace House for the inter-Korean summit, Kim Jong Un wrote in the guest book "a new history begins now" and "an age of peace, at the starting point of history." 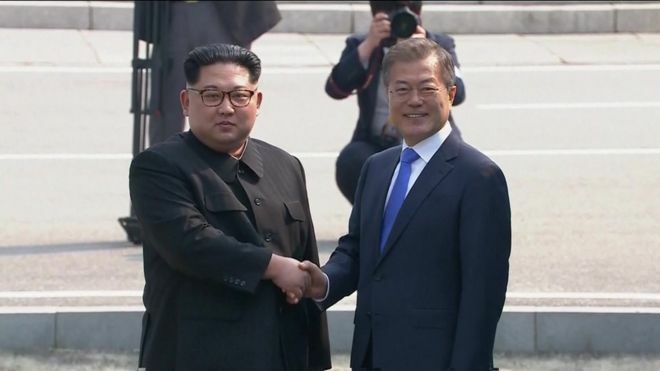 Kim Jong-un has become the first North Korean leader to set foot in South Korea by crossing the military line that has divided the peninsula since the end of the Korean War in 1953. Wondering how this would affect other conflicts in the world? Wonderful news. Let's hope it continues. What a boon these people are giving to the whole planet. Wonder for how long it will last. People say such things among these nations already happened before. Given the history of the division, there is a lot of room for doubt that all will end well. I couldn't begin to understand what N. Korea wants. Their leader is nuts and has a bad hairdresser. Change usually happens from the top down. His top would definitely have to come down. Is he prepared? Korea is still a relatively pristine country. The sheer beauty of its landscape is impressive. Peace often happens when one side gains enough leverage to force the other side to negotiate. N. Korean Nukes and Missile tech has advanced to the point that Americans were running for cover from a false missile alert. N. Korea has the leverage it needs and the N Korean leader has solidified his power internally to the point that he can safely negotiate without fear. Does Iran need to build a Nuclear Bomb to finally get peace from the imperialist war mongers ? They have upheld their side of the Nuclear agreement and behaved rationally. But the the lesson may be that to deal with the US you need to build a Nuclear Bomb as the Americans only understand the language of force. From what i know, Iran do not seek nuclear weapons for ideological reasons. According to Ali Khamenei, the production and use of nuclear weapons is forbidden according to his interpretation of Islam. During the Iraq-Iran war, Saddam used Chemical weapons against the Iranians, but they did not retaliate due to a fatwa from Imam Khomeine forbidding the use of it. The letter mentions the release of the hostages to give the impression that the US gained something after all, but North Korea had to give something and ended up with nothing. Mind games in my opinion. The decision also took place on the same day North Korea destroyed the nuclear test tunnels. Where the world is heading with the current US administration, only days will tell. Indeed. But the report seems to be about cancellation of talks, rather than the imposition of sanctions. Perhaps Trump thought that more pressure was needed before talks, or that the process was going well enough now that the North Korean nuclear capability has been degraded. Either way, the BBC report doesn't tell us. It says nothing about what Trump's reasoning might be. It's almost as if the BBC wants people to think that Trump's reasoning is somehow lacking, isn't it? The cancellation of talks means the prolonging of the "existing' sanctions as the talks supposedly brings North Korea closer to the lifting of the sanctions. The US can afford to wait for the fruit to ripe, but for North Korea they have limited options. This move might trigger North Korea to make more missile tests to stir the situation up. I don't like the North Korean regime, but what has been uttered by Bolton and Pence is indeed offensive from a North Korean POV. Before you open a new page, you show gestures of good will. North Korea showed good will when they released the US hostages and when they destroyed the nuclear test site. The US, on the other hand, kept on referring to Libya, an example that serves as a perfect reminder that they cannot be trusted! The article does not mention Trump's intentions, but i see it as a continuation of his policy since he took office, not only with North Korea, but with the rest of the world including his allies: either you subdue to our demands, or we will confront by different means at our disposal. I do feel that we are witnessing history here, a new turning point in the world as we know it. I feel that if he continues like this, the world will unite against the US, and the beginning will be an economic war, which might end with more serious confrontations or his removal from the white house.